You will Watch Ultimate Spider-Man Season 4 Episode 16 online for free episodes with HQ / high quality. 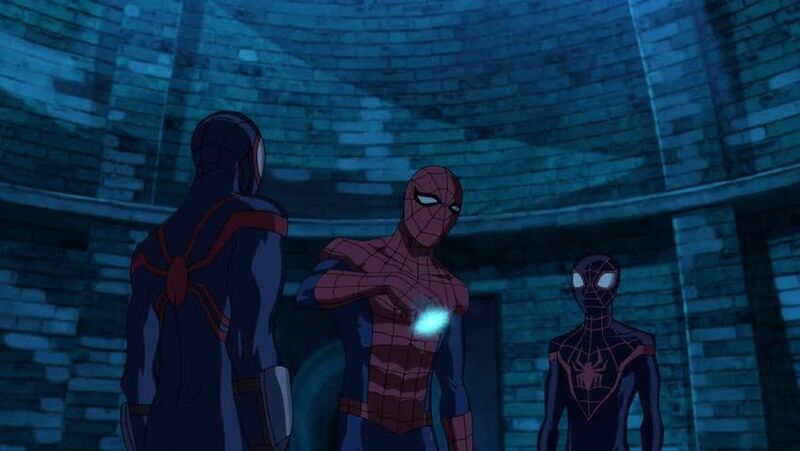 Stream cartoons Ultimate Spider-Man Episode 94 Spider-Ham, Spyder-Knight, and Miles Morales’ mother Rio suddenly appear at Peter Parker’s house. Upon being brought to K’un-L’un by Iron Fist, Spider-Man and Kid Arachnid meet with Nick Fury, Doctor Strange, and Madame Web who states that the shattering of the Siege Perilous scattered it’s fragments to many dimensions, and if they are not collected in time, many universes will crash onto another, and eventually, all of the universes would be destroyed. Using the shard of the Siege Perilous, Spider-Man and Kid Arachnid are sent on a trip to the different dimensions to collect the shards. Their first stop is an alternate Manhattan that is infested with vampires and they have their encounter with the vampire Blood Spider who is the last superhero in Manhattan and has the first Siege Perilous shard. They find the shard in the sewers and encounter the vampiric Lizard King and Wolf Spider who plans to use the Siege Perilous shard to block out the sun so that vampires can roam the Earth. After they are defeated, Wolf Spider manages to get collect one of the Siege Perilous, and reveals his intentions to collect all of the Siege Perilous in order to rule all of the universes.